I know a thing or two about big, blue eyes. My dad has them. My son has them. And one of my favorite clients has them. He has those melt your heart, big blue eyes and the lashes to go along. And he conveniently turned one right when the Arboretum was in full bloom. What a little gentleman. If you've poked around in my site, you've definitely seen this beautiful momma and her babies. Her littlest is almost six months old and I was thrilled when they signed up for a Mommy&Me Breastfeeding Session. [Side note - if you're looking for other breastfeeding sessions, they are in my galleries under the Mommy&Me tab]. Breastfeeding Sessions are a great way to capture the mommy&baby bond and always come with a few bonus pictures of your baby. They also make great Mother's Day gifts...hint, hint. Hello! Notice anything different over here? I've been busy working on a new website, transitioning from a blog to a photography site so people can actually see what I do for clients! I hope you take a minute to browse around and check it out. I still have some tweaking to do, but it's officially open for business. My new blog (with new address - artsymagnet.com/blog) will be more of a mix of my clients and my kiddos. I'll still be sharing our life and what we're up to, just alongside my photography for others. Like last week, when I had a session with a nursing momma and Lorelai got to tag along. She was in love. In love. And I mean that in a "she won't let go of this baby" kind of way. Good thing my client is also a friend and was happy to share her handsome little guy. In case you don't know, I'm a huge supporter of breastfeeding. 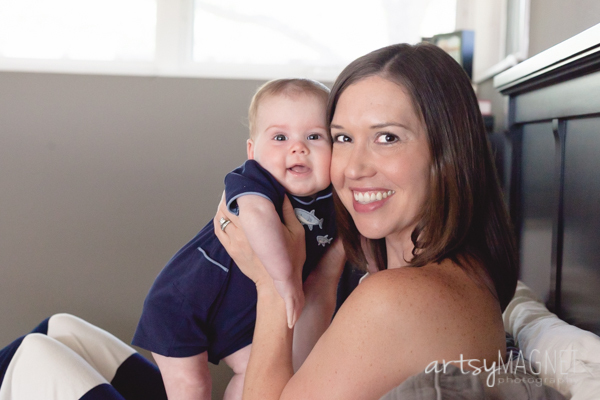 And I love breastfeeding photography because it captures such an amazing time of motherhood. These sessions are truly some of my favorite to shoot and when this momma signed up for one, I just knew it had to be in her mid-century modern home that has amazing light in just about every room. When we moved to the bedroom, Lorelai figured it was her turn to smother, I mean take care of, the baby. But we were able to pry her off just long enough to get a few Mommy&Me shots.